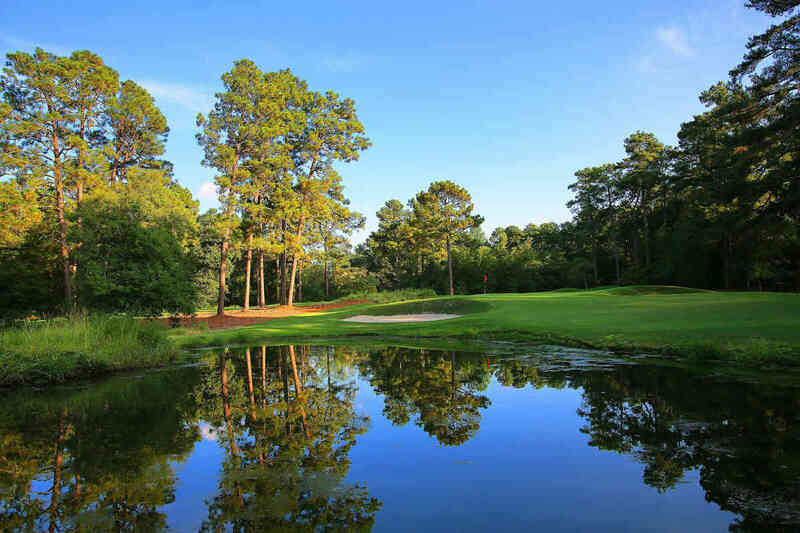 The Pinehurst/Southern Pines/Aberdeen region of North Carolina has beckoned golfers since the late 1890s with its irresistible blend of sandy soil, longleaf pines and championship layouts. In the early days, it served as the laboratory for architect Donald Ross, who crafted more than 40 courses in the Sandhills and elsewhere in the Tar Heel State. Today, 18-hole spreads by Nicklaus, Palmer, Fazio and Coore/Crenshaw supplement those created by the old master. Add superb lodging, dining and cultural options and you’ve got an ideal stay for your group, no matter who’s in your foursome. In fact, so rich and varied are the choices in the region, our perfect weekend has to be four days, rather than three. Off we go. If you’re flying commercially, schedule a mid-morning arrival into Raleigh-Durham International Airport (RDU), then take the easy 70-mile drive to the Pinehurst/Southern Pines Aberdeen region, a.k.a., “the Sandhills.” Check into the venerable Pinehurst Resort and feel the stress start to melt away. Not only is the Pinehurst Resort a perennial Platinum Medal winner in GOLF Magazine’s Premier Resorts Awards, but staying there also provides you with the best access to Pinehurst’s courses, especially fabled No. 2. The iconic, 116-year-old Carolina Hotel is the preferred choice at Pinehurst, though the resort’s other offerings, including the Holly Inn, the Manor Inn, the Carolina Villas and the buddy- and family-friendly Condos offer their own enticements. Nine full-length courses, the new Cradle short course, the Thistle Dhu putting course, the top-rated Pinehurst Golf Academy and several welcoming 19th holes are among the attractions. There's also a state-of-the-art spa and fitness center, tennis, a lake and beach club and nearby shopping. As a superb alternative, the Pine Needles Lodge and its across-the-street sibling, the Mid Pines Inn, both in Southern Pines, serve up charm and quality. 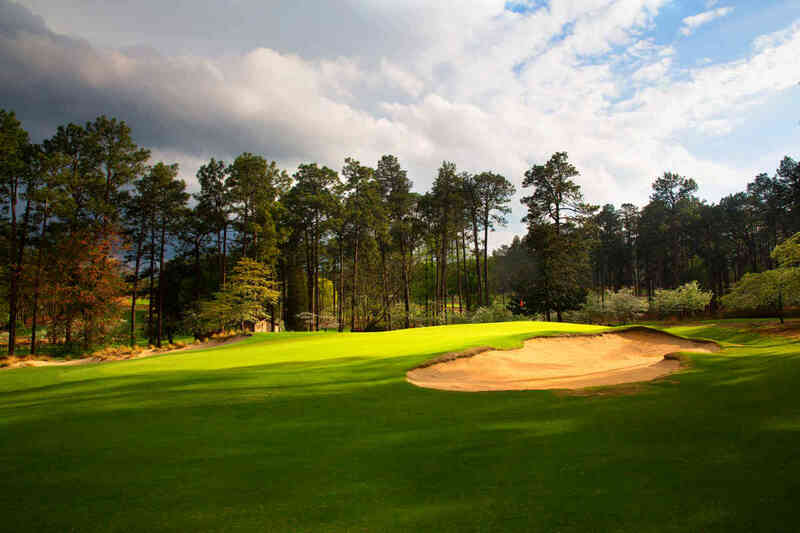 Each features a Donald Ross design that ranks among our Top 100 Courses You Can Play, a significant reason why Pine Needles/Mid Pines achieved Gold Medal status in our most recent Premier Resorts Awards. Cushy, yet refined accommodations, innovative golf schools and terrific dining (yes, treat yourself to Mid Pines’ legendary Country Fried Chicken) are additional highlights. Start with a quick but atmospheric bite at Pinehurst Resort’s Ryder Cup Lounge. Located right off the lobby of the Carolina Hotel, this cozy nook is bedecked with momentos of Ryder Cups past—notably the 1951 edition, contested on Pinehurst’s No. 2 course. I’m partial to the Lobster Crab Cake sandwich and Jerk Chicken Nachos, but you can’t go wrong no matter what you order. Warm-up time, so have a go at the brand new Cradle short course, a Gil Hanse design that opened in early October. The nine holes range from 56 to 127 yards, and are draped atop land that was used for Dr. Leroy Culver’s original nine at Pinehurst in 1898, so you get to soak up the perfect blend of ancient and modern. It’s an ideal practice round at any time of day, thanks to the imaginatively contoured greens and exposed sand framing the holes. The course is adjacent to the Thistle Du putting course, so if you’re looking for extra flatstick action, you’ve come to the right place. $50 (includes replays). After a memorable day of travel and golf, celebrate with a dinner at Pinehurst. The Carolina Dining Room shines—delectable in every way, but we’re going to take a walk down the street and feast at its cousin, the 1895 Grille at the Holly Inn. Intimate, comfortable, yet Four-Star all the way, the 1895 Grille wows with ambiance, an excellent wine list and an inspired mix of classic cuisine and regional specialties. Begin with the Traditional Carolina She-Crab Soup, and follow with the Maple Smoked Heritage Pork Chop and you won’t be disappointed. Conclude your evening with a beverage at the Ryder Cup Lounge, perhaps a Cherry Vanilla Bourbon. For some, that’s all the dessert you’ll need. On a balmy night, take it outside, in a rocking chair on the wraparound porch. Hit the ground running with the hearty breakfast buffet at the Carolina Dining Room, off the main lobby at the Carolina. Cheat on your diet with the biscuits and sausage gravy—you can thank me later. Don’t worry, you’ll walk it off with 36 holes today, and rest assured, there are plenty of menu items that will satisfy the most health-conscious of golfers. Pop’s Lounge at Mid Pines is the ideal lunch spot when you’ve got another round to play. It’s convenient, and during warm weather, it’s perfect for dining al fresco, underneath the umbrellas on the terrace overlooking the 18th hole. The Boros Burger, named for former Mid Pines owner and two-time U.S. Open winner Julius Boros is a solid choice, but so is the Hog Heaven, a grilled hot dog, with house-made pulled pork and cole slaw all piled into a pretzel bun. Stay in Southern Pines for dinner, at Ironwood. Located among the tall Longleaf pines along historic Midland Road on the border of Pinehurst and Southern Pines, this is the Sandhills’ most ambience-rich restaurant. The New American cuisine is replete with modern accents on old favorites. The outdoor, under-cover patio, amid mature Magnolia trees and a fire-enhanced water feature is memorable. Grab a cocktail at the legendary Mr. B’s, the pub off the lobby at the Pine Crest Inn. Owned by Donald Ross for 27 years until his death in 1948, the Pine Crest provides easy access to the Village of Pinehurst. One of the most popular traditions in town takes place here: lobby chipping, a nightly ritual where contestants hit off the lobby carpet to a hole in a board next to the fireplace. Breakfast in-room or at the Carolina Dining Room—but don’t dawdle. You’re tackling No. 2 today. Nowhere does the design genius of Ross burn more brightly than on his No. 2 course at Pinehurst. Host venue to three U.S. Opens, with a fourth on the way in 2024, plus a PGA Championship, a Ryder Cup and countless PGA Tour, USGA and storied amateur events, No. 2 rolls gently and spaciously through tall Longleaf pines. Holes culminate in “inverted saucer” greens that have confounded the game’s very best since they were first grassed in 1935. For the 2014 U.S. Open, won in emphatic fashion by Martin Kaymer, a Coore-Crenshaw restoration brought back the tawny-edged fairways and native roughs last seen in the 1940s. Spend the extra coin and take a caddie. It’s an easy walk, and there’s no better way of experiencing the course—and the fearsome greens—than with a knowledgeable sidekick. There’s no fiercer test of chipping and putting in the game, so your scores may soar—but you won’t lose a ball. Figuring out the puzzles from start to finish is why Number 2 invariably ranks among the Top 10 U.S. golf courses. $370-$480. It’s lunch at the Deuce. Prepare to be amazed. New in 2016 is this 19th hole/pub that overlooks the 18th green of No. 2—hence the name. With a bar area that opens onto a veranda, you can raise your glass and practically touch the statue of Payne Stewart, frozen in bronze forever, celebrating his 1999 U.S. Open win. The 5,000-square-foot restaurant serves lunch daily and a selection of appetizers including my favorite, the Crab Hushpuppy Beignets with Fiery Lemon Aioli. Wash it down with a variety of specialty cocktails and regional craft beers, and take some time to drink in the dazzling array of memorabilia that adorns the walls. I’m partial to the tribute to Payne Stewart’s long-sleeve rain jacket, rendered sleeveless by Payne himself prior to the final round via a pair of scissors. They’ve got the sleeves, and the scissors, nicely shadowboxed in the corner. So many options for both classic and modern golf. Or, take a breather and check out some of Pinehurst’s galleries, or nearby wineries in Carthage and Wagram. There’s a 200-year-old pottery tradition in Seagrove. Handsome historic homes, farms and churches in Southern Pines, Aberdeen and beyond. I’m partial to the Old Sport & Gallery, which houses Tom Stewart’s rare and compelling golf collectables. And if you’ve got more free time and/or the unusual rainy day (most of the Pinehurst-area courses are sand-based, so they drain really well), make arrangements to visit the Tufts Archives a holy grail-type repository for golfers, with early and rare info on Pinehurst and Donald Ross. I can’t deny that the classic resorts of the region serve up terrific food and ambience, but I also can’t deny that once in awhile, after a big-time day on the links, buddies just want a fabulous, humongous steak, with a wine list to match, in an environment that would be suitable for any big city slicker. Southern Prime Steakhouse in Southern Pines is that place. You’ll pay half the price for what the same fare goes for in Gotham—with quality that holds its own. You’re welcome to prowl around Southern Pines, or perhaps enjoy a nightcap at the hotel, but with 36 yesterday, today and tomorrow, your head might just hit the pillow hard at this hour and not surface for another eight hours. The Carolina Coffee Shop, off the main lobby at the Carolina Hotel, is ready for you early risers at 6 a.m., with pastries, fruit cups, energy bars and a variety of caffeinated liquids. There’s nothing on the menu at Tobacco Road’s snack bar that will make food critics swoon, but the atmosphere is top shelf for distinctiveness, which is why it’s worth doing lunch here. The space has an open fireplace vented by an antique, double-flue tobacco curer, while two stone porches provide attractive vistas of the course. Return the rental car (or drive home), board your night flight and toast to the memories of a Pinehurst/Southern Pines/Aberdeen golf vacation. You missed some great courses on this trip—including Pinehurst No. 9, a Jack Nicklaus creation; Mid South, an Arnold Palmer design; and Pinehurst No. 4, currently being redesigned by Gil Hanse—but now you have a reason to come back.